The Rare Stuff: Elvis Costello Trainspotter Gap-Plugger Extravaganza, VOLUME TWO!!! Elvis Costello Trainspotter Gap-Plugger Extravaganza, VOLUME TWO!!! At last! Here's the long overdue, second full-length installment of our trip through Elvis Costello's back pages. The entire group of rare items I've compiled for this next batch totaled 32 tracks; I have placed them in alphabetical order and split 'em in half. Here's the first half of the batch, featuring the tracks listed below. In addition to uncompiled tracks from the '90s Rykodisc reissues of his catalog, bonus tracks from import versions of some albums, and a few guest spots and/or compilation contributions, I've also thrown in two tracks (one in each part) which were made available only through "official" free downloads from media sources; specifically, The New York Times' nytimes.com (the excerpt of the writing demo of the Costello/Cash/Kristofferson collaboration "April 5th," which the three would ultimately perform on Spectacle); and the Boston Phoenix' phoenix.com (the delightful version of Waiting for Guffman's "A Penny For Your Thoughts" from an award ceremony for Christopher Guest). I included these last two because they're semi-official, lots of fun, and many might not know they exist. Apart from those two, these tracks are all (well, almost all) out-of-print and otherwise unavailable; none are available to purchase for download (at least in the U.S.), and all are, generally, hard to find on the 'net. I should mention that a very few tracks here differ only slightly from some that have been officially released, in the forms of remixes or alternate takes; here, again, is the master list of "gaps" from the great Costello wiki. Sorry I've kept the faithful waiting so long, but here's one half of a heaping helping of The Rare Stuff, Costello-style! Next part posting later this week -- I promise. Meanwhile, enjoy. Oh, and I'd be doing myself a disservice if I didn't also take this opportunity to ASK FOR CONTRIBUTIONS. I've spent oodles of dough over the years to gather these rare tracks -- and more recently, specifically for the purpose of sharing them with you. I know times are tight, but if you can bestow any thanks in the form of a small donation to the Paypal address in the right column -- a mere fraction of what you'd have to pay to purchase all these recordings -- it would make a humble blogger very happy. I know, I know, everything online's supposed to be free. If you can't swing anything, don't feel bad, of course, please help yourself to the tracks and enjoy the heck out of 'em! But at least please leave a comment, and perhaps investigate a commercial message or two to the right as well. Every little click helps. Dirty Rotten Shame Elvis Costello Complicated Shadows 7"
Do You Know What I'm Saying? 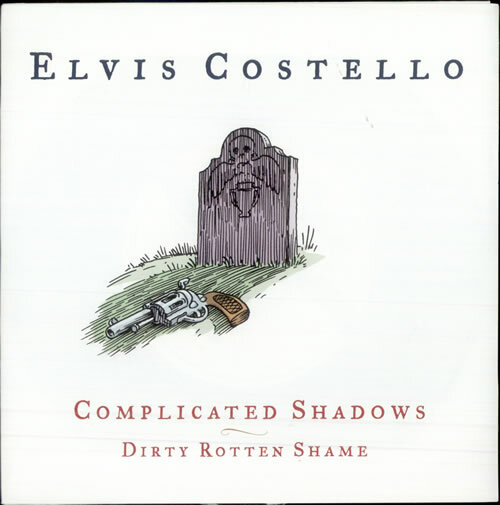 Elvis Costello 13 Steps Lead Down 7"
Gloomy Sunday Elvis Costello Gloomy Sunday - Ein Lied von Liebe und Tod - O.S.T. Thanks PopC, for compiling and putting this together, and, of course for sharing it with us. As with the other compilations, although I do already have some of it, much more of it I don't have, and it's great to get these all put together. Thanks again! Hey - thanks for this new great-looking comp! Thanks for the responses, keep 'em coming! BB, I'm glad the balance is on the "don't have" side! Todd, WTTV is downloadable from iTunes, and can be listened to once through in its entirety at lala.com -- at least until lala is shut down on 5/31! I make it a point to not post anything here that is commercially downloadable (and for the most part, not currently in release at all, though I've made a few teeny exceptions on these EC comps). Great stuff. You surpass even a nut like me in tracking down all of this, and you definitely surpass me in then taking the time to compile it.